Want to Connect with Students at MCAA18? Start Here! Looking for new talent to secure your company’s future? Hoping to connect during MCAA18? Start your research here! A new search option helps you easily narrow your search to those candidates who are joining us at MCAA18. Look for it to the left of the Search by Keyword area, click the circle to select it and hit submit. Be sure to check back often… students are adding their resumes daily. Looking for a specific skill like BIM or Autocad? Enter it into the keyword filter and you’ll get an instant list of students who fit the bill. Just want interns? Only looking for full-time professionals? The results can also be filtered by job type, so you can narrow them down depending on your needs. Access to the resumes is exclusively for MCAA members, giving members first dibs on the talent the association’s Career Development Initiative has helped to nurture. 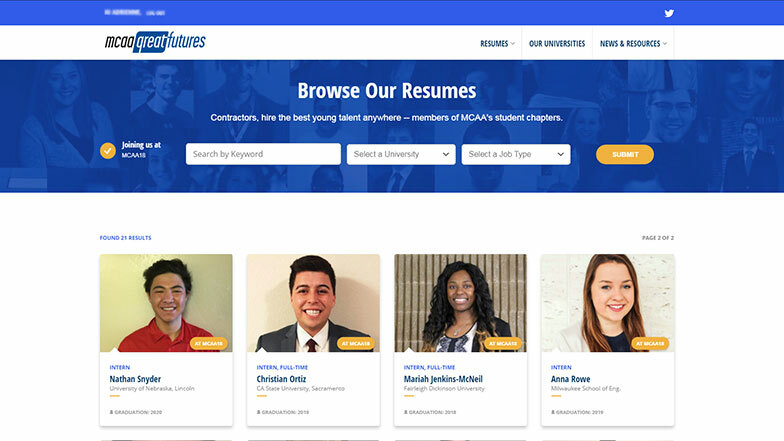 To see candidate details, simply login with your MCAA.org username and password. So reach out and get in touch. You may just find the next star employee to ensure your company’s great future! Find your great future in the mechanical industry. Browse Our Resumes!Hire the best young talent anywhere. Browse Our JobsLooking for the best young talent?